Klaus Berger’s ‘The Truth which was Kept from Us’ is—to say the least—so intriguing you’ll drop everything you’re doing and read through it. You’ll be simply astounded upon learning about the extent of what you DON’T know—and that’s only for starters. 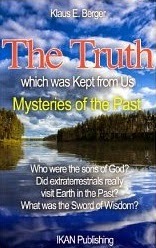 Indeed, ‘The Truth which was Kept from Us’ contains information that can be so shocking to many people—myself included. I mean, imagine if the majority of Jesus Christ’s teachings—which didn’t reach the great masses of people through generations—were actually made public right at the get-go, we could have spared ourselves a lot of bloodshed throughout history. On a personal note, I find the divine wisdom that author Klaus Berger so comprehensively discusses in this book so evocatively life-changing—finally, here’s something that will wash over your soul like warm rain. And when I say “comprehensively,” I’m not kidding—Berger leaves no stone unturned when he reveals not only Jesus’ hidden teachings, but also what we can do about these teachings in order to transform our very lives. Let me suffice it to say that this is an incredibly powerful book—something you don’t read lightly, yet it’s something that you or everyone MUST read. Get a copy of this book today, especially if you’re like me who have been wondering about what we could all have been missing from the big picture. Highly recommended—also makes a great gift to like-minded friends. Five stars for this one.